The past can be very important for those living in the present. My research experiences as an archaeologist have made this very apparent to me. Echoes from the distant past can reverberate and affect the lives of contemporary communities, and interpretations of the past can have important ramifications. In Federalist 63, Madison pointed out that the principle of representation was not exclusive to modern republics. In the Roman Republic, Madison thought, the Tribunes of the plebs were “annually elected by the whole body of the people, and considered the representatives of the people, almost in their plenipotentiary capacity.” Representation was not unknown to the ancients. When it comes to Roman poets, most have heard of Horace (Horatius Quintus Flaccus). Horace is the freedman’s son who, against all odds secured the patronage of Maecenas, Augustus’ right hand man. What role did the Greek and Roman classics play in the making of the American Constitution? Existing scholarship has put the main emphasis on the political theory of republicanism. What do the pamphlets of the English Civil War, imperial theorists of the eighteenth century, Nazi schoolteachers, and a left-wing American artist have in common? Correct! They all see themselves as in dialogue with classical antiquity, drawing on the political thought of ancient Greek writers. Nor are they alone in this; the idea that Western thought is a series of ‘footnotes to Plato’, as Alfred Whitehead suggested in 1929, is a memorable formulation of the extensive role of ancient Greece within modernity. “You Greeks are children”. That’s what an Egyptian priest is supposed to have said to a visiting Greek in the 6th century BC. And in a sense he was right. We think of Ancient Greece as, well, “ancient”, and it is now known to go back to Mycenaean culture of the second half of the 2nd millennium BC. But Egyptian civilisation is much earlier than that: in the mid 2nd millennium BC it was at its height (the “New Kingdom”), but its origins go right into the 3rd millennium BC or even earlier. Although a man named “Homer” was accepted in antiquity as the author of the poems, there is no evidence supporting the existence of such an author. By the late 1700s, careful dissection of the Iliad and Odyssey raised doubts about their composition by a single poet. Explore more about the “Homeric question” and the influence of these epics in the infographic below. In 2003 Paul Bahn led the team that discovered the first Ice Age cave art at Creswell Crags in Britain. In recent years, many more discoveries have been made including the expanding phenomenon of ‘open-air Ice Age art’. In the slideshow below, you can see some of the earliest examples of art on the planet, and take a tour of prehistoric art throughout the world. 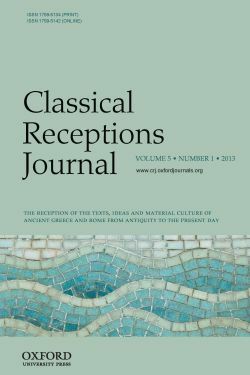 One might think of classicists as the most tradition-bound of humanist scholars, but in fact they were the earliest and most enthusiastic adopters of computing and digital technology in the humanities. Today even classicists who do not work on digital projects use digital projects as tools every day. One reason for this is the large, but defined corpus of classical texts at the field’s core. Despite much build-up to the new Star Wars film, one of the lesser-known news stories of 2015 described the transformation of a statue of Lenin, standing in a square in Odessa, into one of Darth Vadar. This metamorphosis was necessary to comply with a law passed by the Ukrainian Parliament in April 2015 that banned communist propaganda. Streets were renamed and monuments removed, though even before the law was passed some statues of Lenin had been torn down or mutilated, possibly in protest against Russian influence at a time of heightened political tension. Latin, then, was a ubiquitous and commonplace language in the Renaissance, widely spoken, read, and written across Europe and beyond. If the defining characteristics of what has variously been called a “world language” and a “universal language” are its number of non-native speakers and its international circulation, by the time Erasmus was writing his Colloquies and Shakespeare his comedies Latin had been a paradigmatic world language for well over a millennium. The so-called “Getty Hexameters” represent an unusual set of early Greek ‘magical’ incantations (epoidai) found engraved on a small, fragmentary tablet of folded lead. The rare verses provide an exciting new window into the early practice and use of written magic and incantatory spells in the Greek polis of the 5th century BCE. The quiet corridors of great public museums have witnessed revolutionary breakthroughs in the understanding of the past, such as when scholars at the British Museum cracked the Rosetta Stone and no longer had to rely on classical writers to find out about ancient Egyptian civilisation. But museums’ quest for knowledge is today under strain, amid angry debates over who owns culture. "Hendy's book is a marvellously rich history of an institution through a period of dramatic change."